Shichi-Go-San (七五三) is a milestone event that celebrates the health and well-being of three, five, and seven year old children. Traditionally, three-year-old boys and girls, five-year-old boys, and seven-year-old girls celebrate this event, however many parents nowadays will get all their children dressed up in kimono at the same time regardless of how old they are to get family photos. The children get dressed in kimono, take photos, and visit Shinto shrines. The actual date of shichi-go-san is November 15, but children often get dressed up and take photos in the month before this date. In this article, I’ll outline all the items needed for each age group, and some of the special kitsuke rules for dressing children. Note: Both boys and girls can participate in shici-go-san, however the boys kimono at three years old is identical (but smaller and oh so cute!) to a five-year-old boy. Because of this, portion will cover the girls kituske only. 1. Padding: a towel should be folded in thirds and wrapped around the waist. The completed look for a three-year-old girl. 2. Nagajuban (長襦袢): This juban does not have any sleeves. The haneri is colorful and includes children’s patterns such as rabbits and toys. The collar should be sitting right against the neck. girls don’t lower their collars until they are ten-years old. 3. 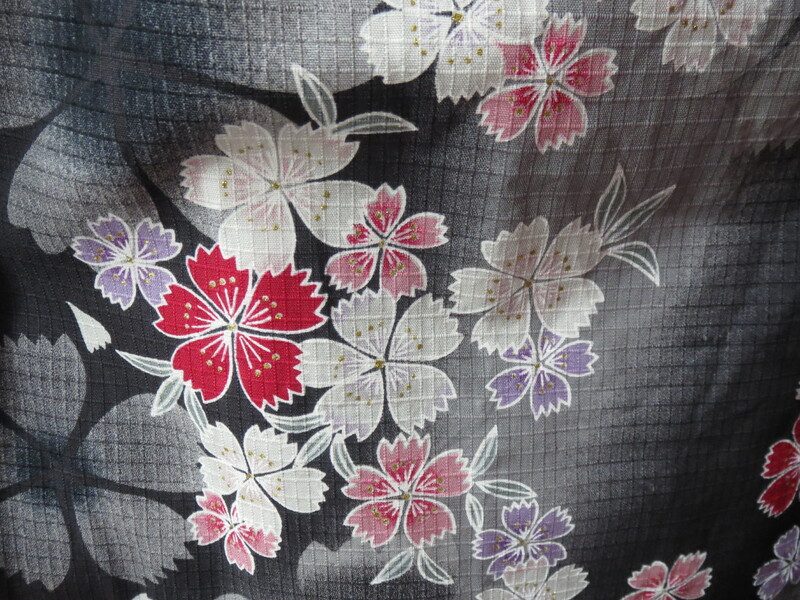 Kimono (着物): The kimono is brightly patterned with tucks in the shoulders. 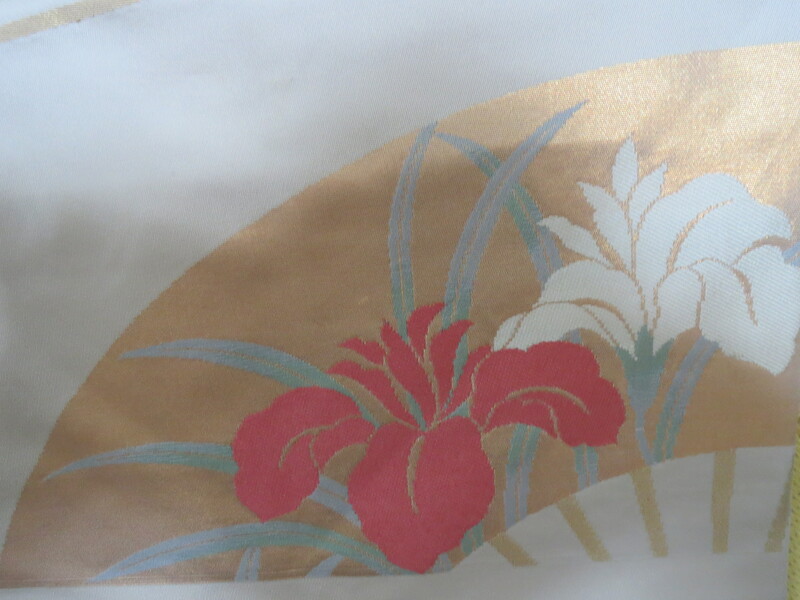 sometimes, this kimono has an ohashori sewn in at the correct height to make it easier to get dressed. 4. Obi (帯): three-year-old girls do not wear an obi. 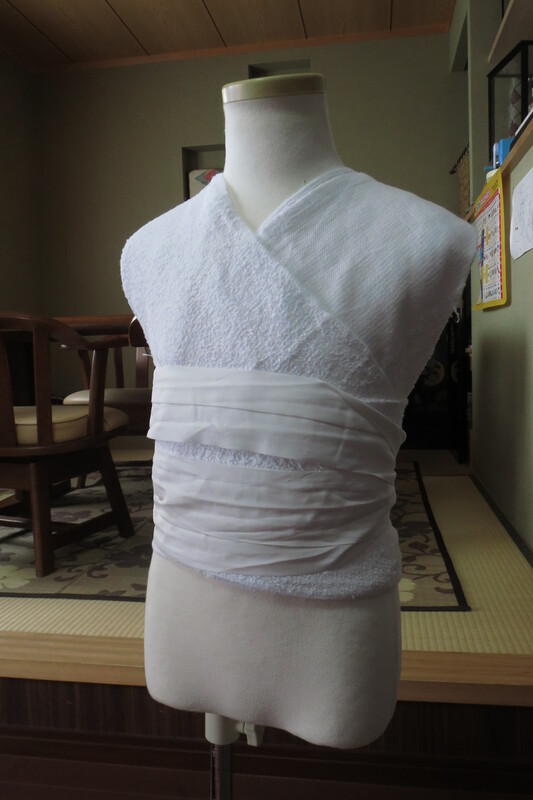 As a substitute, a shibori obi-age can be tied around the waist in place of an obi, but it is not necessary. 5. Hifu (被布): The hifu is the apron or overcoat. Nowadays, it is worn exclusively by three-year-old girls. Note: girls do not traditionally celebrate shichi-go-san when they are five years old. 1. Padding: One towel should be folded in thirds and wrapped around the waist. A juban for five-year-old boys. The lack of sleeves makes it easier to dress a squirming child. 2. Nagajuban (長襦袢): This juban does not have any sleeves. The haneri for the boys is solid white or grey (unlike the girls). The back of the collar should be sitting right against the neck. The koshihimo should be tied as high as possible to keep the collars in place. 3. 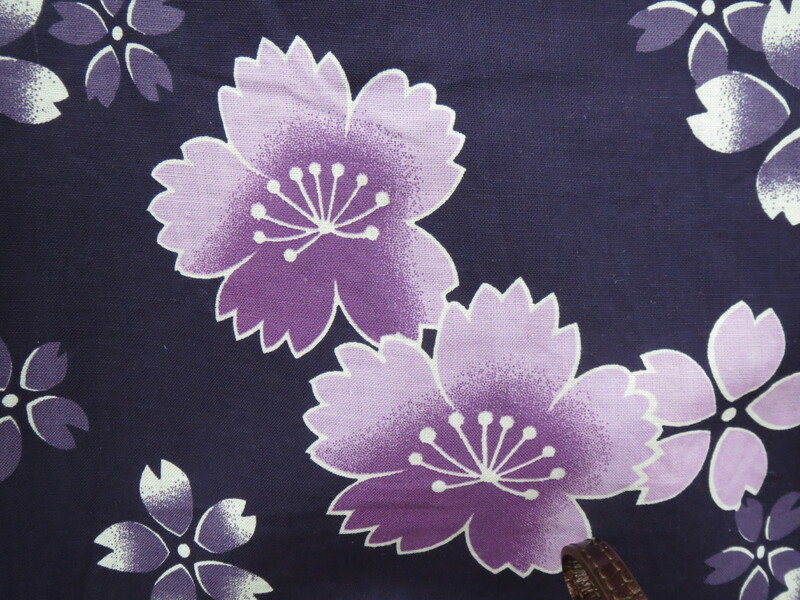 Kimono (着物): the kimono that this studio uses for the boys are a solid color with no patterns. tucks are sewn into the shoulders. The koshihimo should be tied as high as possible to keep the collars in place, while still remaining hidden underneath the obi. 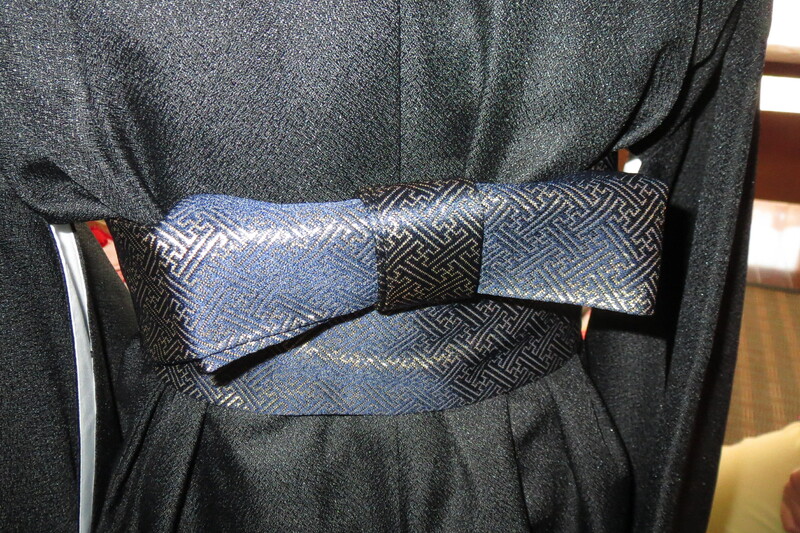 The obi tied in an ichimonji musubi. 4. Obi (帯): The boys have a choice between a pre-tied obi and a regular (albeit child-sized obi). If a regular obi is used, it should be tied in an ichimonji musubi (very similar to a chou-chou musubi but the obi is folded in half instead of three mountains). 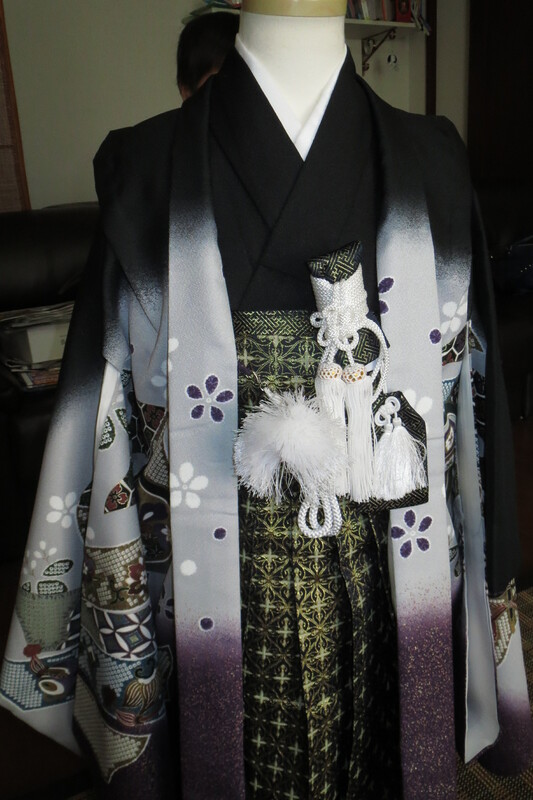 The height of the obi should be determined by measuring the length of the hakama first. The hakama should reach to the child’s ankles. These hakama are pre-tied. There is a snap sewn to the back of the cross and it snaps into place at the correct height. The straps pull tight and are tied at the back underneath the hakama. 5. Hakama (袴): When dealing with kids, the more tricks you can use to make things easier, the better. 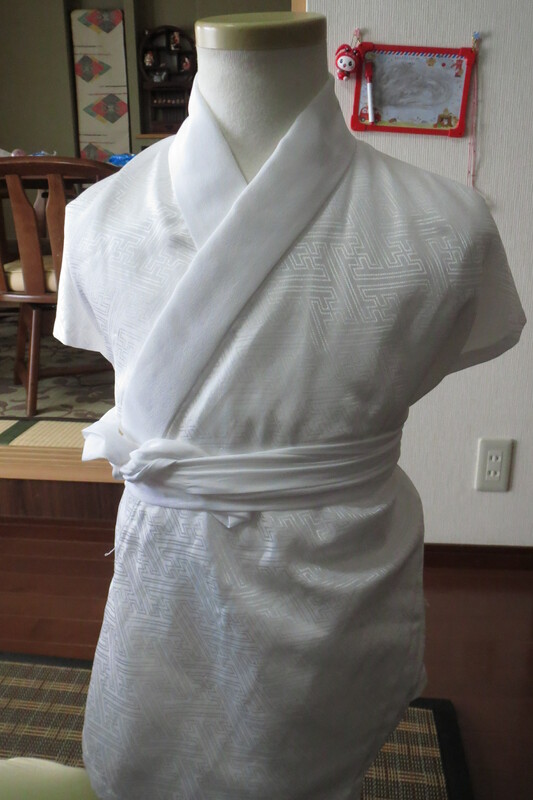 Hakama, like obi, can come in tsuke (pre-tied) forms as well as the regular version. For the pre-tied version,the cross at the front is sewn into shape, the ties all come around the back to tie under the hakama and out of sight, and the cross has a snap on the back that attaches it to the hakama at the correct height. 6. Haori (羽織): After putting on the haori, secure the haori himo, and fold the collar down in half at the back. 7. Ken (剣): The ken (short sword) is slipped into the hakama on the left side, and tilted so that the top is slanted to the center of the chest. Note: boys do not traditionally participate in shichi-go-san when they are seven years old. I have the most pictures of this process because it is the most difficult. 1. Padding: towels go across the chest and wrapped around the waist. This nagajuban has no sleeves to make dressing easier. 2. 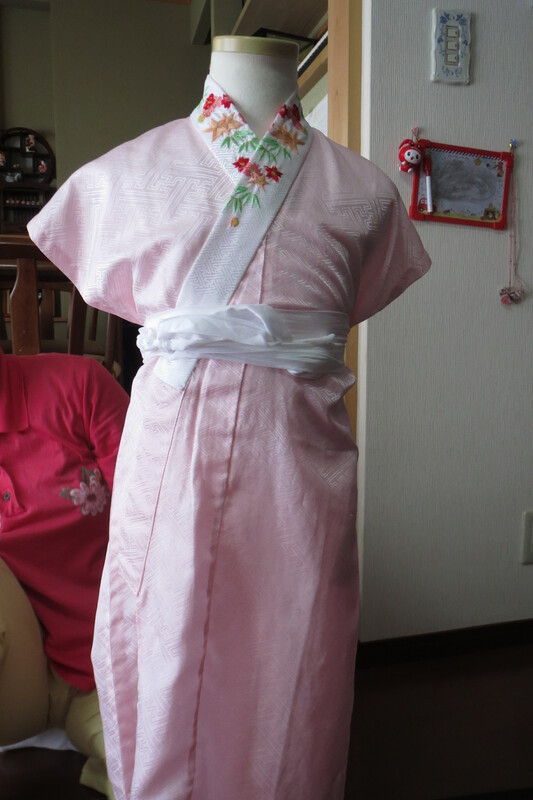 Nagajuban (長襦袢): This juban does not have any sleeves, and the haneri (usually with cute, childlike motifs like rabbits) is already attached. The collar of the juban should be flat against the neck. Only when a girl turns ten does the collar drop down. 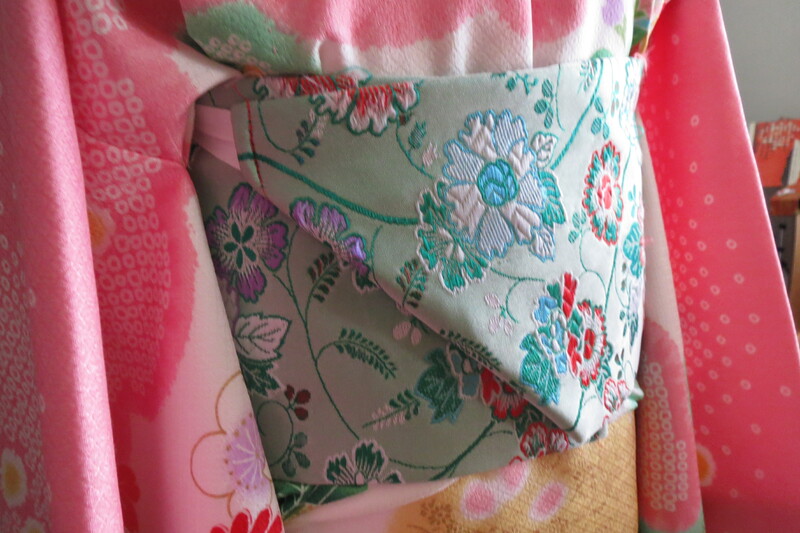 Here is the kimono with a nii-juu age. About 1 cm of juban collar should be visible. 3. 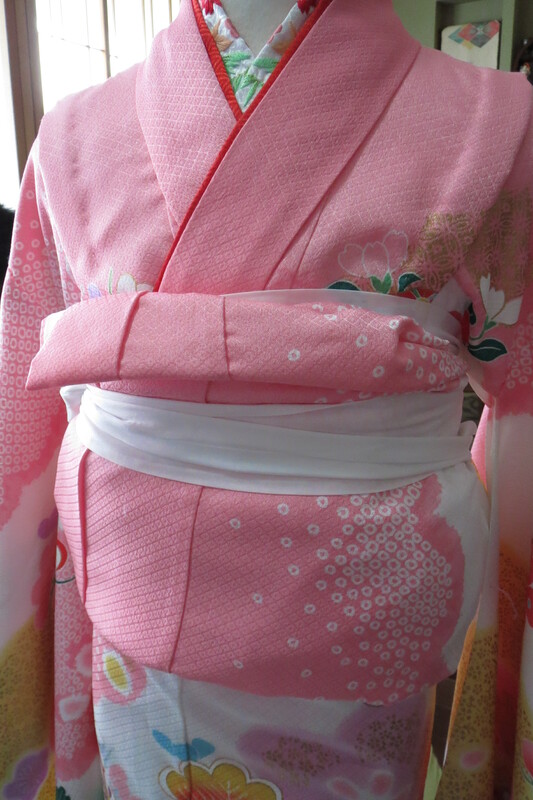 Kimono (着物): These small, child-sized kimono have some key differences from adult kimono, most notably that there are tucks sewn into the shoulders of the kimono, and the sleeves are furisode length. Here are some of the key things to remember when dressing a child. 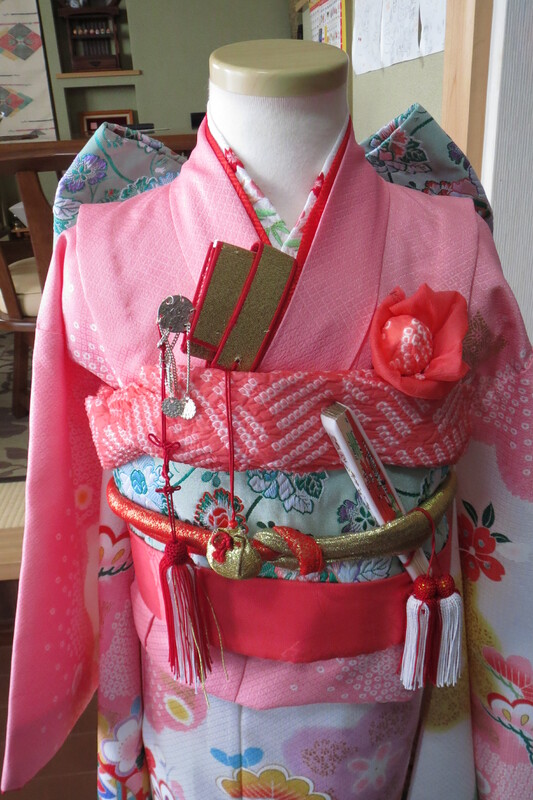 (a) The koshihimo that secures the kimono is tied higher up on the body than on an adult kimono. This gives the illusion of longer legs. (b)About one centimeter of juban collar should be showing. 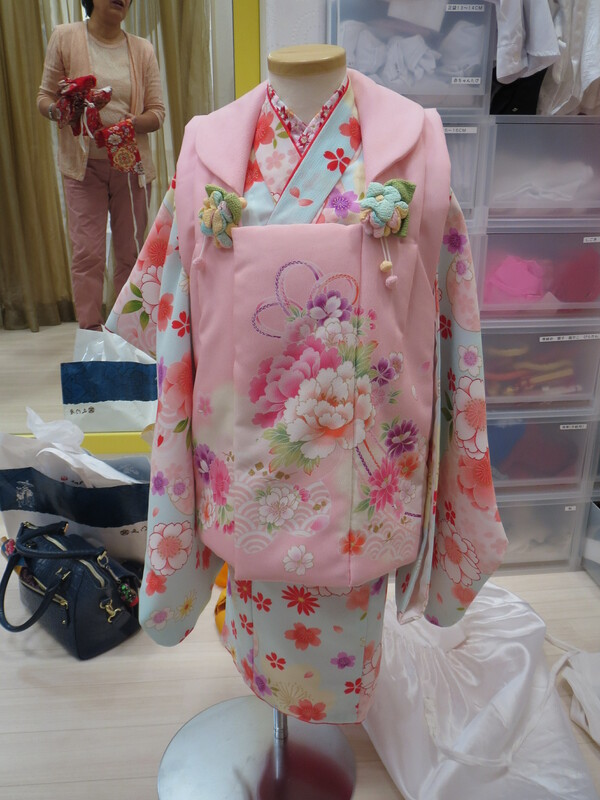 (c) The left side seam of the kimono should be running straight down. It should not be pulled to the front. 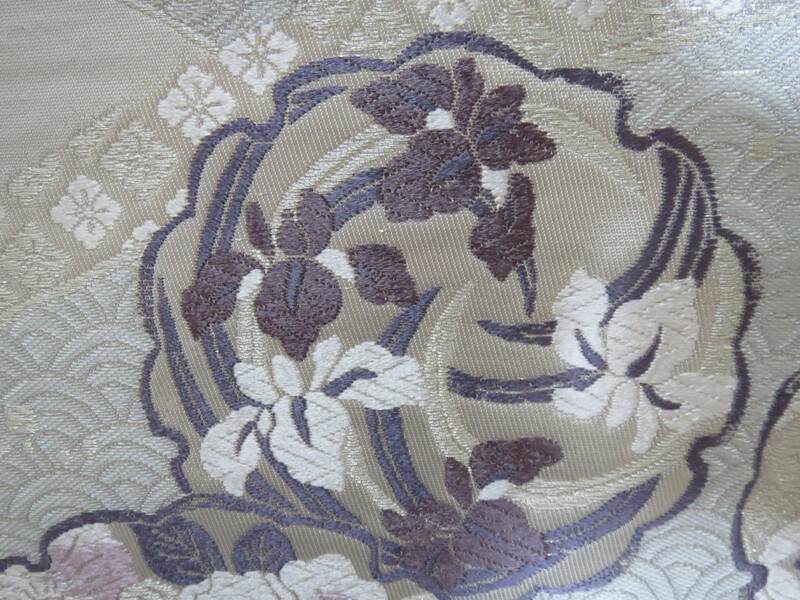 (d) In order to match up the okumi seams, it is usually necessary to create a nii-juu age (a double ohashori). This has the added benefit of moving all of the bulk of the kimono high enough so it will be hidden by the obi. 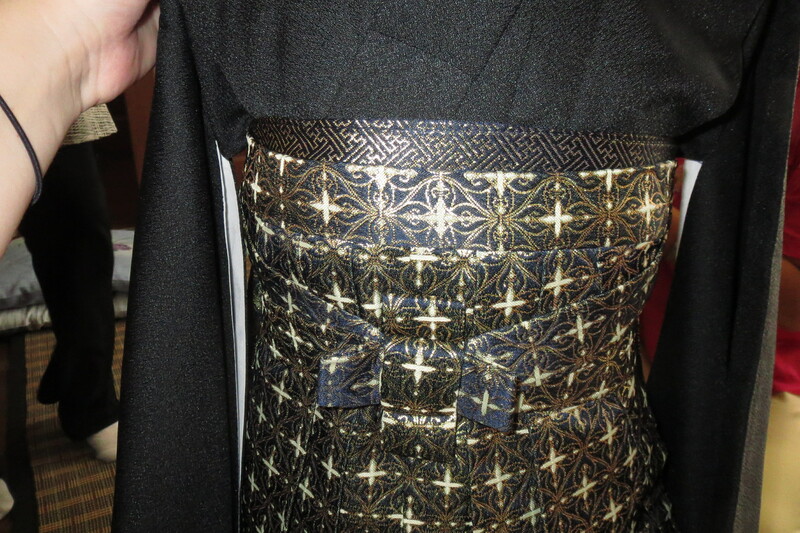 This is the back of the pre-tied obi before the bow is inserted. Folding up one corner gives it a nice look. The bow should be high enough that the tips are visible over the shoulders. 4. Tsuke obi (付け帯): With children, it’s important to make everything as easy as possible, and this is especially true for the obi. wrap the waist portion of the obi around the waist and match them at the back. fold up the bottom corner of the obi to create an aesthetically appealing look, and insert the obi bow. The top tips of the bow should be visible from the front over the shoulders. Here is the shigoki tied at the back. The tails should be the same length. 5. 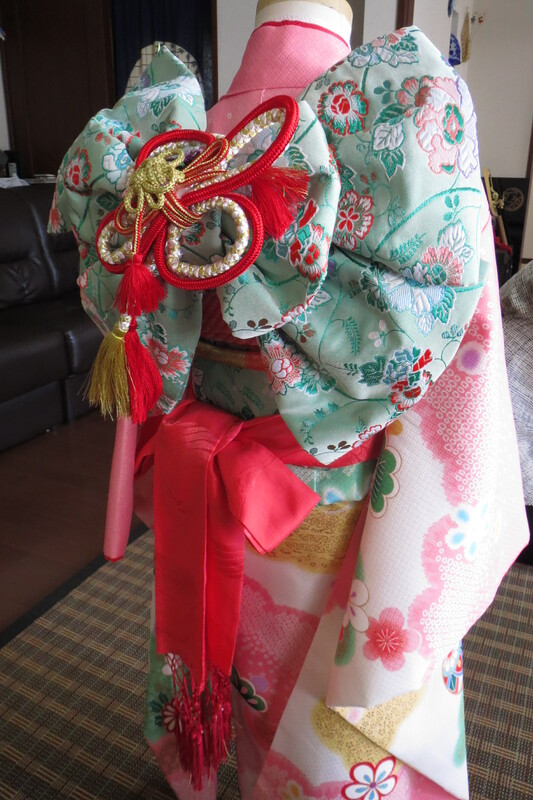 Obijime (帯締め): for such a formal occasion, a stuffed obijime is used. 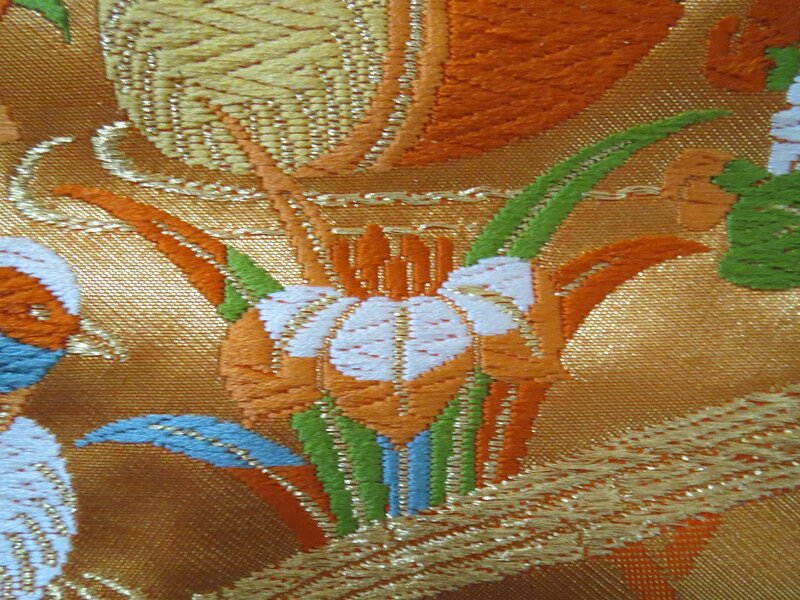 For a two-toned obijime, the gold end should end up on the left side of the child, and the knot should be centered with the cross of the juban and kimono collars. Since this is a celebratory occasion, both tassels should be pointing up. 6. Obiage (帯揚げ): A shibori obiage is always used, and fancy ties are encouraged. My teacher has developed a unique way of creating a flower in the obiage. 7. Shigoki (扱き): the shigoki is a red scarf that is wrapped around the bottom of the obi. It should be folded first in thirds, then in half. With the edges pointing up, match up the bottom of the obi with the folded edge of the shigoki. Wrap it around the back, and tie in a nice big bow on the left hip. Here is the completed front view. 8. 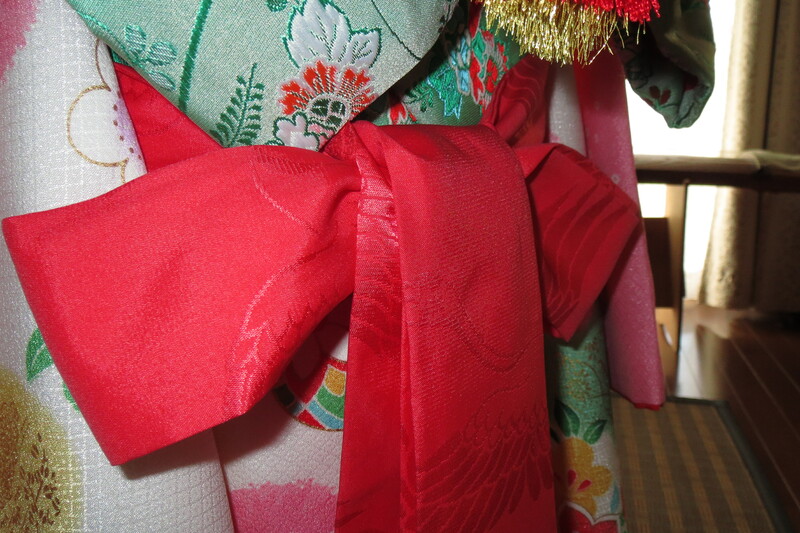 Hakoseko (筥迫): This decorative touch should be slipped into the collars of the kimono above the obi. 9. Sensu (扇子): The fan should be placed on the left side behind the obijime. The top of the fan should be angled inwards. 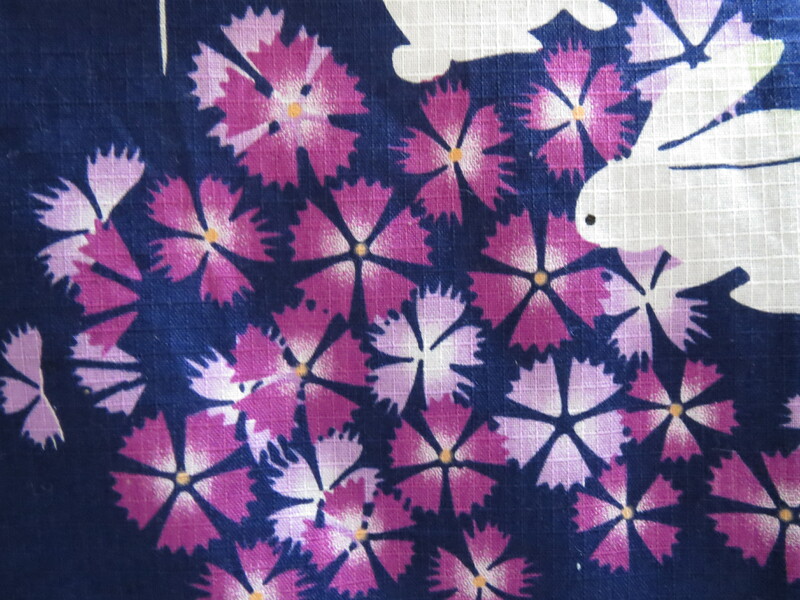 The sayagata is usually used as a background design that is woven into the cloth for solid colored kimono or accessories. 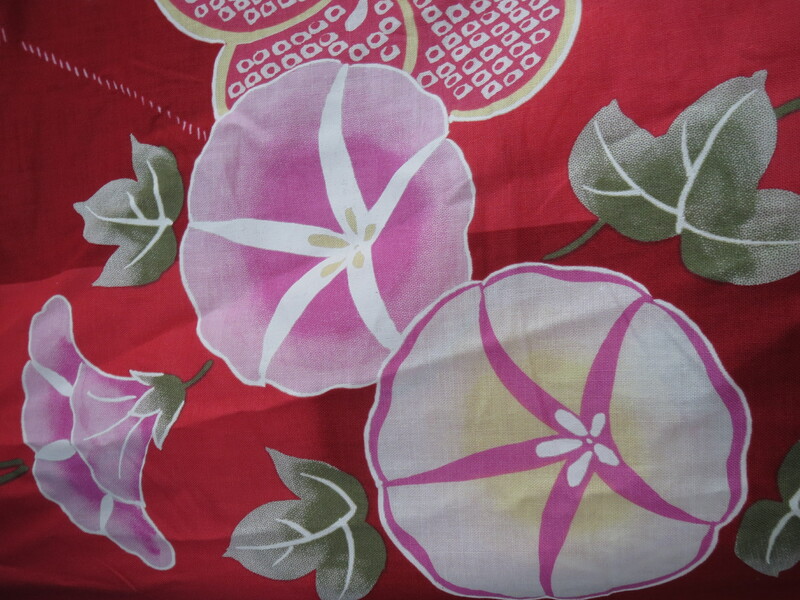 It is especially popular for iromuji kimono or items that use rinzu silk (which also makes it very hard to photograph!). The design consists of interlinking manji, and the manji are always depicted on the diagonal. 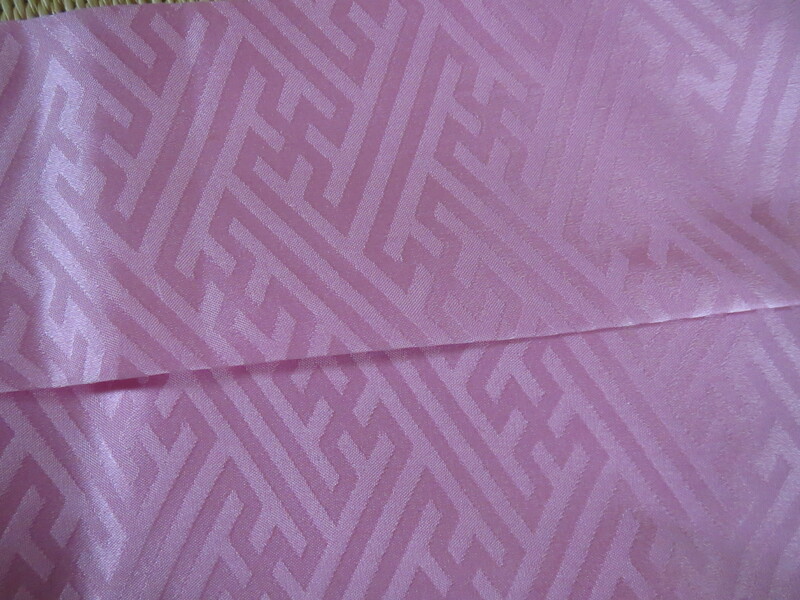 History: This pattern is an especially popular motif for edo komon kimono. It was first developed in the Muromachi period and was favored by samurai. Later, it was adopted by townspeople during the Edo period. 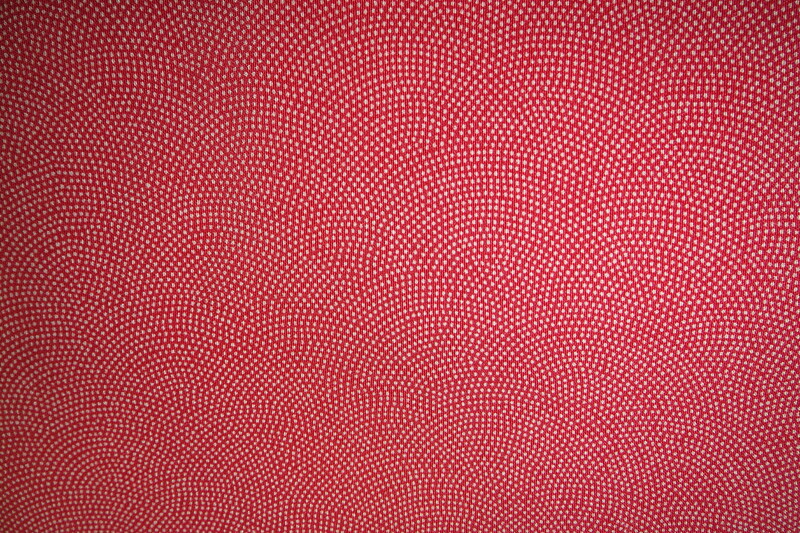 Same (鮫)translates as shark and komon (小紋) translates as fine pattern. 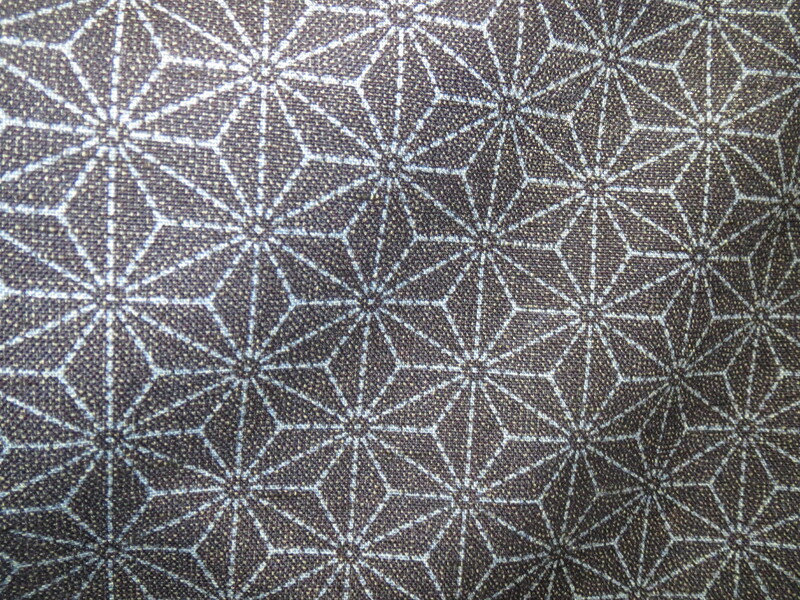 Same komon motif on an edo komon kimono. From a distance, the kimono looks like a solid color. History: There are records of hemp being used in Japan as early as the Jomon era (10,00-300 BC). Some of the most popular uses of hemp today is in the construction of ropes for shrines, temples, and sumo rings. 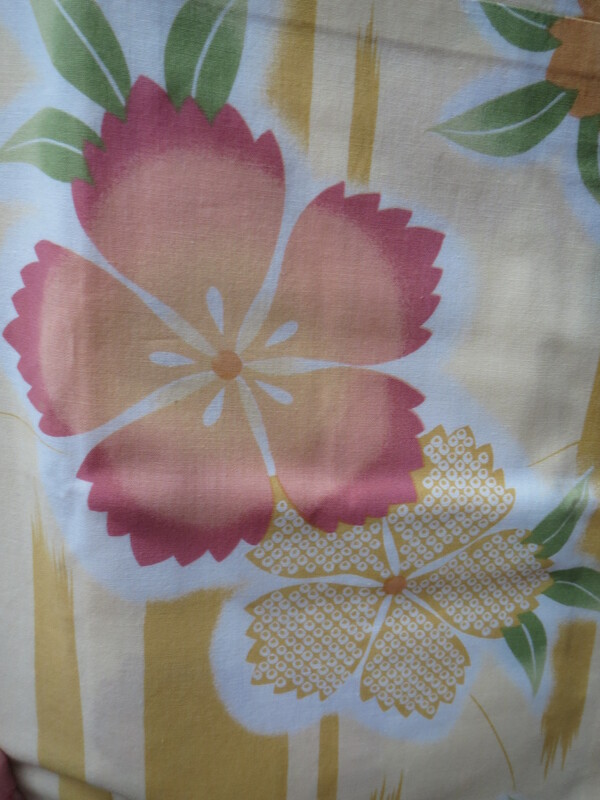 Hemp is also a popular fabric for summer kimono and juban. 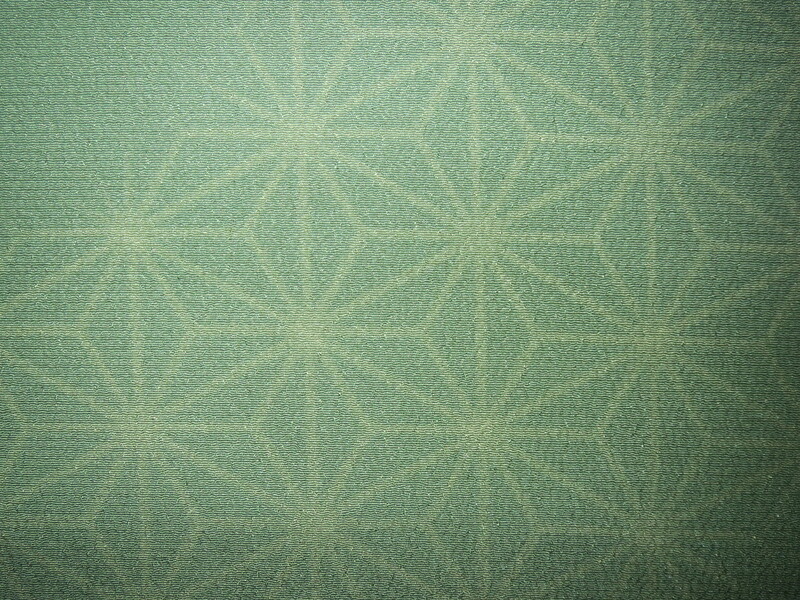 The motif asa no ha is often used as a background design on kimono made of a wide variety of fabrics (not just hemp). 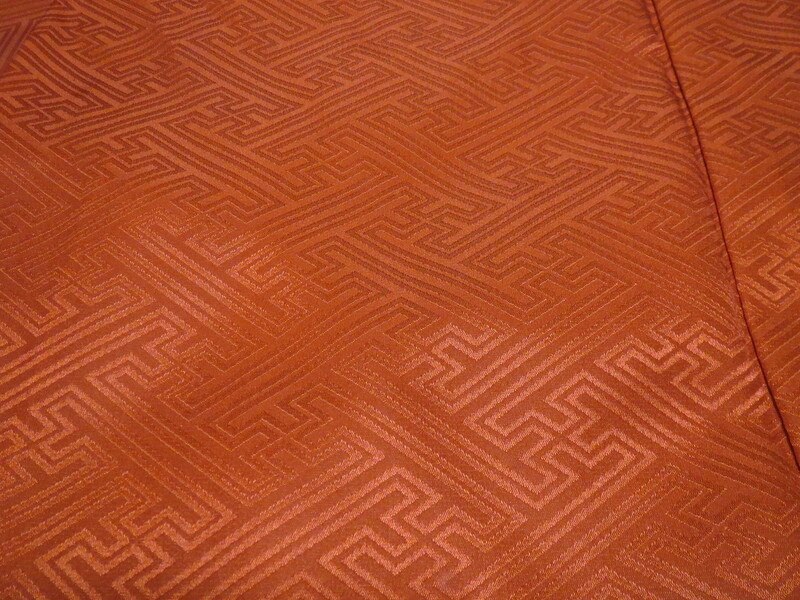 It is often a popular motif on garments for babies to signify the parent’s hopes that their child will grow as strong as a rope made from hemp. Some people see triangles when looking at asa no ha, and others see a six pointed star. Both of these are correct. 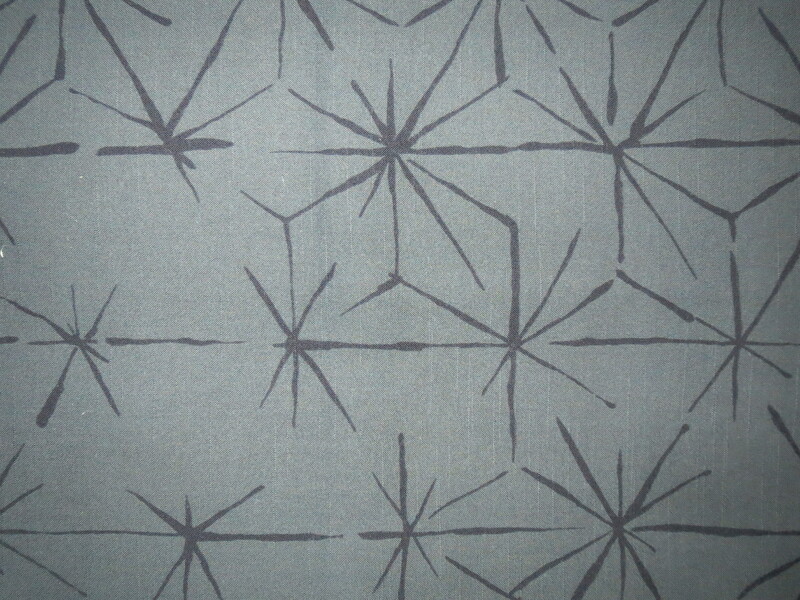 Asa no ha is also sometimes called mutsuboshi or six pointed star. This is only one example of the multiple species of ayame that grow in Japan. The three types of iris usually referred to as Japanese iris bloom from early May to late June. This caused some ambiguity to Heian era poets. Should the iris be considered a spring flower or a summer flower? According to Haruo Shirane in Japan and the Culture of the Four Seasons, different sources originally placed it in different seasons. 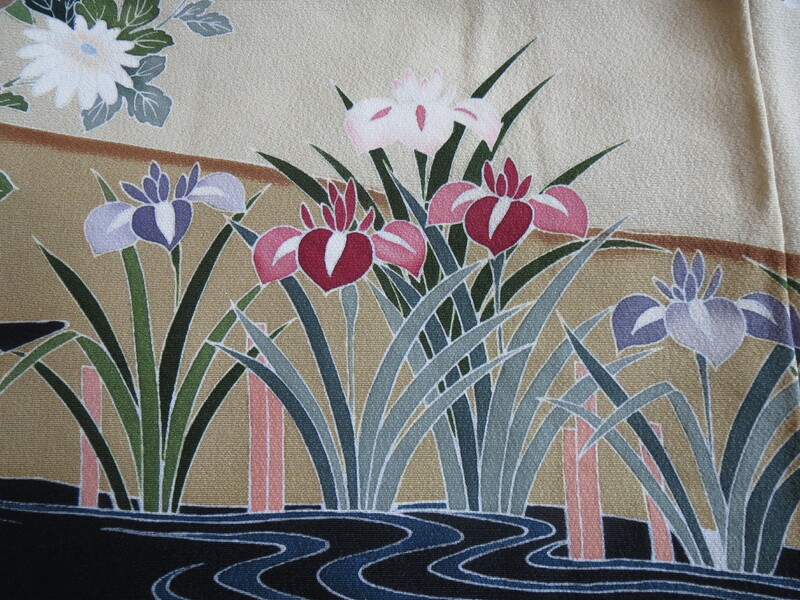 Shirane states that colour combinations for the juni hitoe that were indicative of the iris placed the kakitsubata in summer, however waka poets used the flower as a spring motif. A defining moment came when the influential editors of anthology Horikawa hyakushu decided to place kakistubata in spring, and hanashoubu and ayame in the summer due to their prominence in the Tango festival (held on the fifth day of the fifth month). This distinction had a lasting effect on poetry anthologies with seasonal themes, however the poets themselves continued to treat the iris as a summer motif, and by the Muromachi period, its identity had firmly returned to summer (pg 52-53). In addition to this, the classic Japanese calendar, puts the blooming of the iris firmly into the summer months. Before the Meiji Era, Japan used a different calendar (a luni-solar calendar). According to the modern solar calendar, the traditional four seasons are as follows. This traditional seasonality, which rules all seasonal kimono motifs, would place the blooming of the iris firmly in the summer season. A final note on seasonality, I have many pieces in my collection (see below) that are awase (lined) and not designed for summer. So what does this mean? For me, it means don’t rely on the iris to tell you what season a certain piece should be worn in. Also consider if the piece is awase (lined) or hitoe (unlined) or ro (gauze) and any other motifs present on the piece. The combination of all these elements will tell you when to wear your kimono or obi. 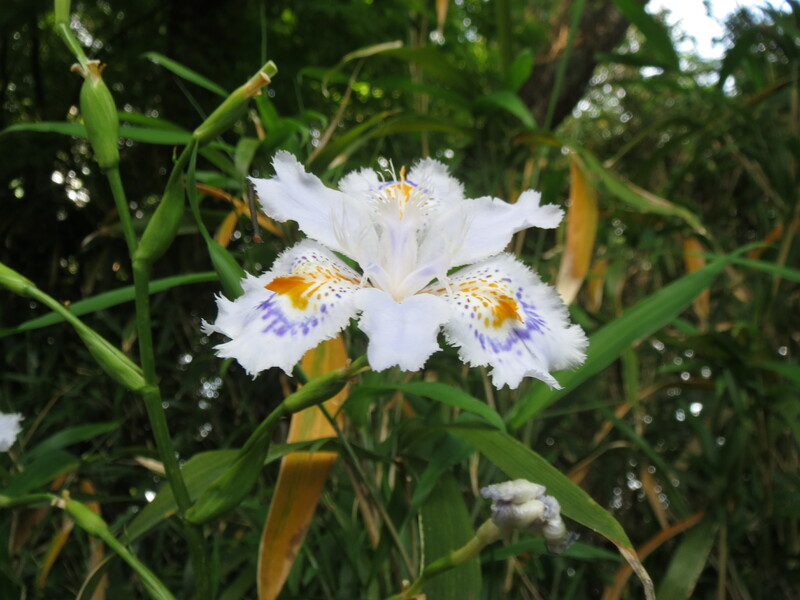 Traditionally, the iris is linked to Boy’s Day (now Children’s Day, celebrated on May 5th) because the leaves resemble swords and the name shoubu is a homonym for militarism. 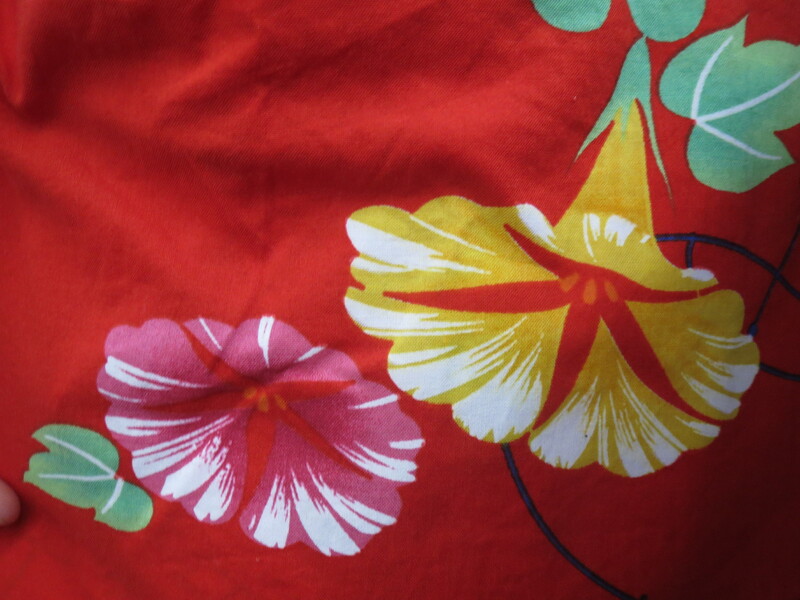 Iris can often be found on boy’s kimono. Kakitsubata was made famous by its appearance in The Tales of Ise, a Heian era poetry anthology. It is also the prefectural flower of Aichi prefecture. The most distinguishing feature of the iris is the three petals that grow downwards. These petals can be smooth or jagged, but the all have a distinct vein running down the center. Iris also have a clump of smaller petals that grow upwards. Finally, iris have long, thin leaves that usually accompany the blossom. The nadeshiko has always had a strong association with women and love. The phonemes that make up the word (nade=stroked/petted and ko=child) indicate a strong personification of this flower. In fact, waka poets saw the nadeshiko as a personification of a girl who has been raised by a man. The nadeshiko’s association with women is still just as strong today. In the modern world, the term yamato nadeshiko is used to describe the ideal Japanese woman, the characteristics of which can be found here. In addition, the name of The Japan National Woman’s Soccer Team, one of the darlings of Japanese sporting world, is Nadeshiko. 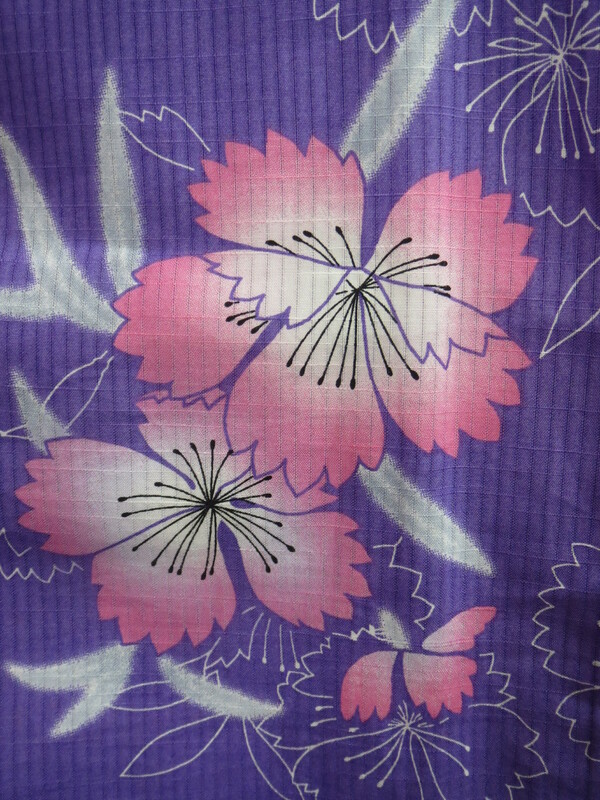 During the Heian period, nadeshiko would be a name applied to a juuni-hitoe that was appropriate for summer. The specific colors of this gown vary with different sources, but maroon, crimson, scarlet, pink, and lavender are all colors that are associated with it. The seven flowers or grasses of autumn. It’s unknown who first put together this group of plants as a representation of autumn, but it is a classic theme of even the oldest Japanese poetry. kikyo (Chinese bellflower) NB: occasionally, asagao (morning glory) is substituted for kikyo. Nadeshiko is another flower with five petals (see below). The petals of the nadeshiko are ragged at the edges. The morning glory was originally introduced from China for medicinal use as a laxative during the 9th century. The plant was well established during the Heian period, and there is a minor character named Princess Asagao present in The Tale of Genji. During the Edo Period, the asagao was cultivated as an ornamental plant. Historically, asagao was considered an autumn motif in the pantheon of seasonal waka poetry, and it is sometimes included in the classical seven flowers of autumn (see below). However currently, the asagao has come to represent summer more than autumn. 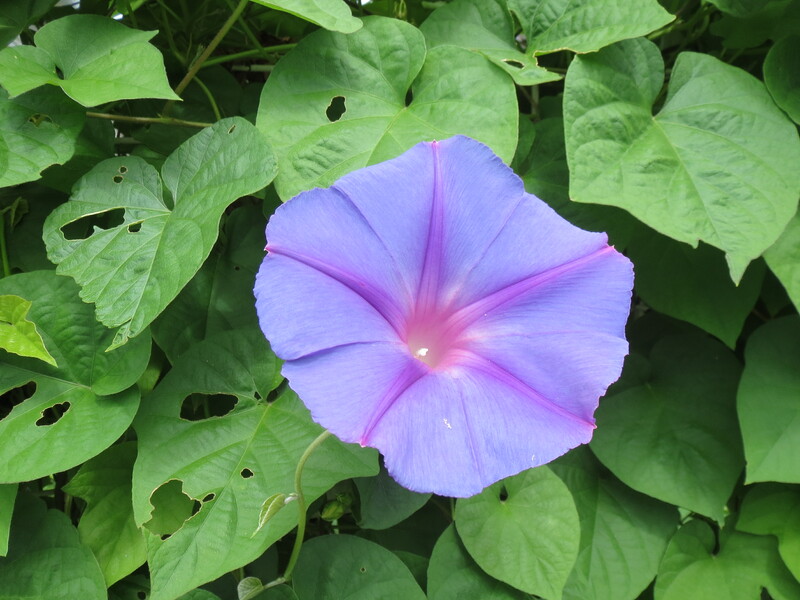 In fact, it is one of the few flowers today that is instantly recognized as a summer motif in Japan. The easiest way to identify an asagao is to look for a thin, five pointed star the reaches out from the center of the flowers to the edges of the petals. This star will always be a different colour than the surrounding petals. The petals of an asagao will not be distinct, but will be a circle with varying degrees of smoothness around the edges. Another identifying feature of the asagao is its trumpet-like shape. The leaves of the asagao have three points all pointing downwards.